Tagline- The Grads are Going Undercover in the City to Unmask the Master mind of Crime. 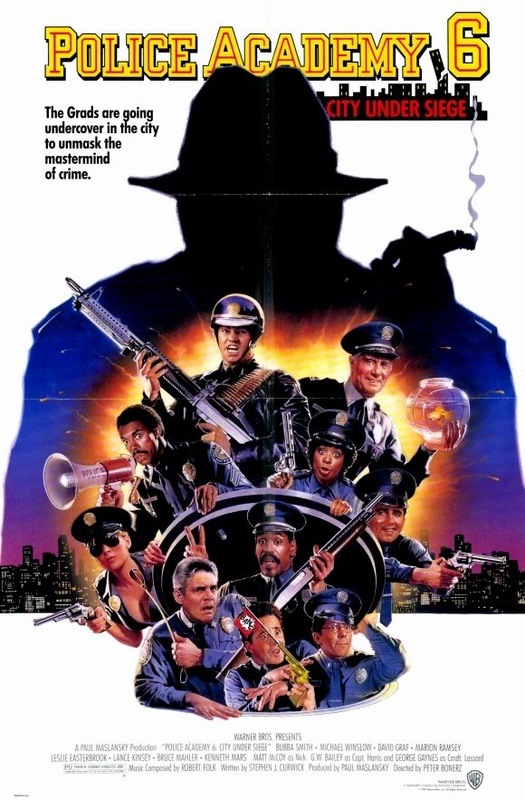 Released in 1989 Police Academy 6: City Under Siege was pretty much the death of the series. In past reviews I mentioned how I felt the Police Academy films were sort of the comedic versions of Friday the 13th as each more or less are light on plot and what there is of a plot is basically a rehash of the other parts. However both were mindless fun and were able to go on longer than most franchises, but at some point enough is enough and it got to that point with Police Academy 6. As I’ve also mentioned in other reviews each sequel pulled in less than the previous film, but they all turned a profit and as of this point the first 5 all opened at number 1, but that changed here as Police Academy 6 was the first to not open in the top spot and only pulled in roughly 11-million dollars down about half from part 5. It is common for sequels to have a higher budget than the original, but in some cases if there aren’t returning actors you can still keep the cost down, but when actors return the budgets might go up a little more even if still can be kept reasonable. Since a good portion of the cast once again returned I’d have to assume the budget had to go up a bit and the 7th film had a budget around 10-million (and it only made 126-grand!) so I would think Police Academy 6 probably had a budget around 10-million or a little less. All the Police Academy films except the 7th came out within a year of the past and sometimes even less and this came out less than a year later than the 5th and from 1984-1989 there were a total of 6 films and this one isn’t as poor as I’ve may have said in other reviews for the series, but it also was as of this release by far the weakest (7 though would make this seem like comedic gold), but I don’t think this film really could have been much better due to overkill. The Police Academy films aren’t known for their plots, but this one while no exception does have a tiny bit of a plot and its not a complete rehash either though it does take some elements from part 2. A trio of thieves always remain one step ahead of the police as the person they’re working for has inside information. When Commandant Lassard (Gaynes) is accused of being the inside man the members of his police academy set off to clear his name and capture the real mastermind. The screenplay was written by Stephen Curwick who also wrote part 5. The 5th film is actually my favorite sequel as its just silly fun and while the writing wasn’t great it was entertaining. The script here isn’t quite as entertaining, but it does have some amusing bits. While all the sequels were more or less the same thing I still felt they worked, but this point some of the antics were a bit tiresome. The characters while still fun pretty much repeat themselves, but the cast helps continue to make it at least a little funny. Really at this stage in the series nothing could have been done as the formula for the series was done to death, but to Curwick’s credit he does the best he can and in someways it was a little successful. Director Peter Bonerz does a fairly decent job as for the most part Police Academy 6 is decently paced, but like most of the sequels in my opinion does begin to run out of steam by the end. While never as funny as the past 5, it does however feature some fairly funny scenes and at the end of the day Police Academy running at only 84-minutes makes for a decent enough time killer and you could do a lot worse like the 7th film. As a series goes on unless sequels aren’t related like the Bond series or outside of a remake, there really isn’t much a filmmaker can do to keep things fresh without straying, which would probably be the wrong move. So to the credit of Peter Bonerz he makes the best out of a very tired series. The core of the cast from part 5 return including Matt McCoy. Also returning is Bruce Mahler as Fackler who was last seen in part 3 and his return was welcomed as he’s quite funny. The standouts were again Captain Harris (Bailey) and Proctor (Kinsey) who make the very best out of cliched material. Harris and Proctor were my favorites in the series and their scenes in not only this, but the 4th and 5th films were the highlights of each. After this film however several cast members would exit the series and their losses were very much felt in the 7th film. Overall Police Academy 6: City Under Siege isn’t exactly a good film, but its better than I made it out to be in other reviews for the series. At this point again the formula was tiresome, but there was enough here to keep it fairly amusing. As I mentioned Police Academy 6 only pulled in about 11-million dollars and I assume the budget was between 7-10-million so there wasn’t much of a profit made. The film itself also looks a bit on the cheap side not that the others had Oscar worthy production values, but this one looked cheap. I own the blu-ray collection released by WB in the UK, which is region free and while none are demo worthy, they look fairly good, but part 6 looked like an upconverted DVD and perhaps a better transfer things would look better. As of this film it was easily the weakest as the gags are quite tiresome, but there are enough decent moments to keep it above float. WB realized it was a sinking ship, but 5-years later someone thought it would be a good idea for a 7th film and that would be hands down the worst of the series and as mentioned the lowest grossing of the series and buried an already dying franchise. Part 6 is again weak, but has enough going for it to make it a decent time killer. 1989 wasn’t a good year for franchises and ignoring box office adjustments Friday the 13th Part VIII: Jason Takes Manhattan would be the lowest grossing of the series, Halloween 5 would also be the lowest grossing and while A Nightmare on Elm Street 5 even at the time wasn’t the lowest total it was however way down from the last two and of course Police Academy 6 would be the lowest grossing at this time, but again 7 would pull in less. And all of these franchises would return, but all took a few years until the next (except Elm St., which was two-years later until the next).